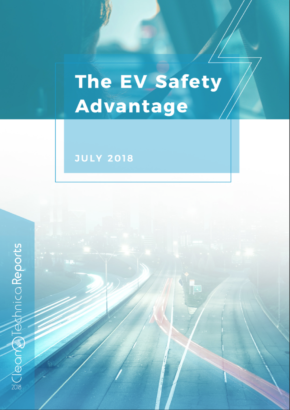 Recently, I have been involved in a number of discussions on CleanTechnica about the range required for an EV to do longer journeys, and to be considered more than just a “city car” for local runs. My own attitude is that every person on the planet, and all of the local and national governments, need to focus on reducing their carbon footprint, and their consumption of resources. This is “Spaceship Earth” and like passengers on any ship, we have to be careful about our use of the limited supplies of food, water, and electrical power, and be very mindful of how much waste we create, and how we dispose of it. We all have to become much more responsible, behaving like adults, rather than like spoiled children. My commitment to this shift is that I drive an electric car. 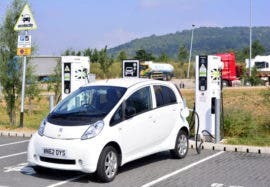 I find it a bit disappointing when people say they won’t dive an electric car unless it has the same range, and speed, as their internal combustion engine (ICE) car, and unless the fuel (in this case electricity) is equally widely available. Are they really unwilling to make the smallest sacrifice to save our beautiful planet? Because truthfully, current electric vehicles are vastly superior to their internal combustion engine counterparts, so no sacrifice is really required, just a change of bad habits. 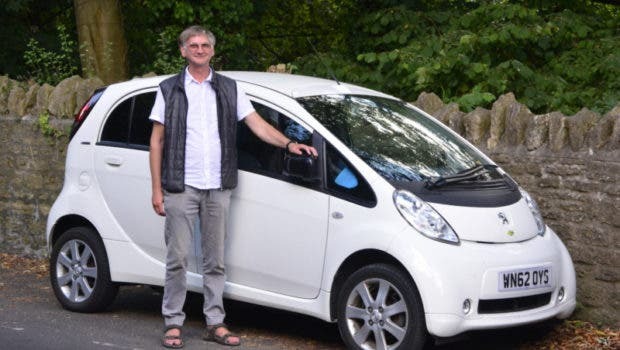 The Peugeot iOn that I drive was designed to be a city car, and has a relatively short range of 70 miles (112 km) at a maximum. Most of the time I am driving well within that range, with an average trip of about 10 miles. But I wanted to test the idea of what is a “city car” by taking it on longer trips. Because, really, just about every highway-capable electric vehicle can do longer trips, so to suggest that a specific car is only good for city driving is rather arbitrary. One of the longer trips I make is to my youngest daughter in Somerset in the South of England, from where I live in North Leicestershire, a distance of just over 150 miles/240 km. I wrote the following diary of my last trip to look at just how this ‘city car’ was going to do on this longer journey. To see the route, click here. Time: 07:40 – All my luggage and gear is packed up in the car, and I am just setting off. This leg of the journey is about 45 miles, and first takes me to the A42 near Ashby-de-la-Zouch, a splendid name for a town, about 15 minutes from where I live. The A42 becomes the M42, going south, past Birmingham, and then going west towards the M5, and Worcester. The destination is Hopwood Park Services on the M42, just a few miles before we hit the M5. 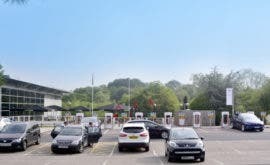 Time: 8:41 – I’ve just arrived at Hopwood Park Services to charge up. This is my first stop on the road. It’s been quite a pleasant journey, so far, but I’ve been driving for an hour, and I’m feeling quite tired now, and in need of refreshments. I really don’t understand these people who say they can drive 200 miles without stopping, because I’ve only been driving for 45 miles, and my back’s hurting a bit, and I’m altogether tired of sitting in the driving seat. So, we’re all plugged in now. According to the electricity pump my little car has 30% battery capacity left. At 30% this is at least 20 miles, a third of the battery capacity, nearly, so we are doing quite well on range. Of course, I would probably not have made it to here if I had just sped on at 70 mph the whole way. So I contented myself with doing around 60 mph, getting some wind shielding behind various large vehicles. It’s a much more relaxing way to drive, and 60mph is 1 mile per minute, and 88 feet every second, fast enough for me. 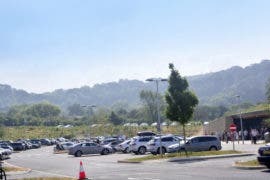 Time: 9:15 – I’m about to depart from Hopwood Park, having charged up to nearly 90%, so I’ve got enough to get to the next stop, which is Gloucester Services, the famous services with the Hobbit-hole restaurant. So, we’ll see how the journey goes from here. The route moves southwards on to the M5, after about 7 miles, then we continue on that motorway for about 40 miles, past Worcester, towards Gloucester. 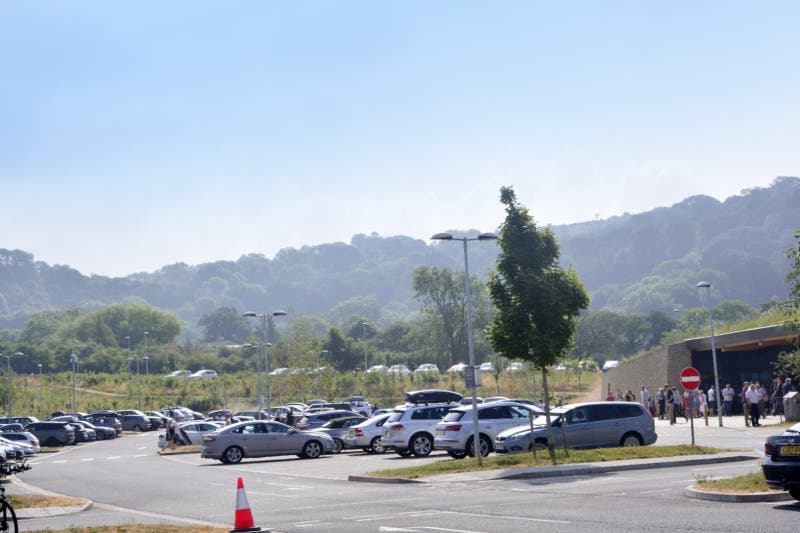 Time: 10:17 – I have arrived at Gloucester services, on the M5, and this is the second stop on our route. They offer the nicest services there are, really, and I was impressed enough to have written an article about them. I’m going to charge up now. This is one disadvantage of this particular car that, having such a short range, we haven’t got quite enough to get all the way to my daughter’s house from here, unless I charged to 100%, which takes too long. So, I’m going to have to stop at the next services, too, which is only 15 miles away, just to make sure we’ve got enough to get to her house, which is 43 miles from there. We could just do with a tiny bit of extra range. 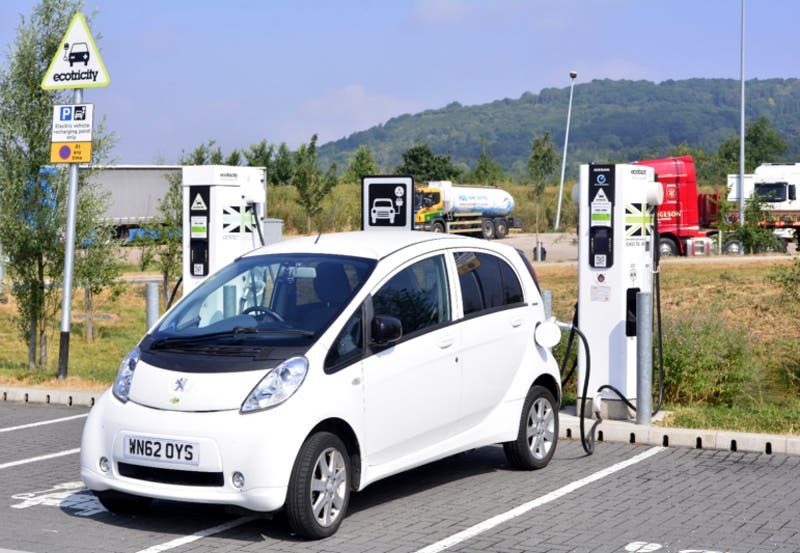 Many modern electric cars have more than sufficient range, like the 2018 Nissan Leaf with a range of around 185 miles, which means it has the capacity for these longer journeys (see my article for details). 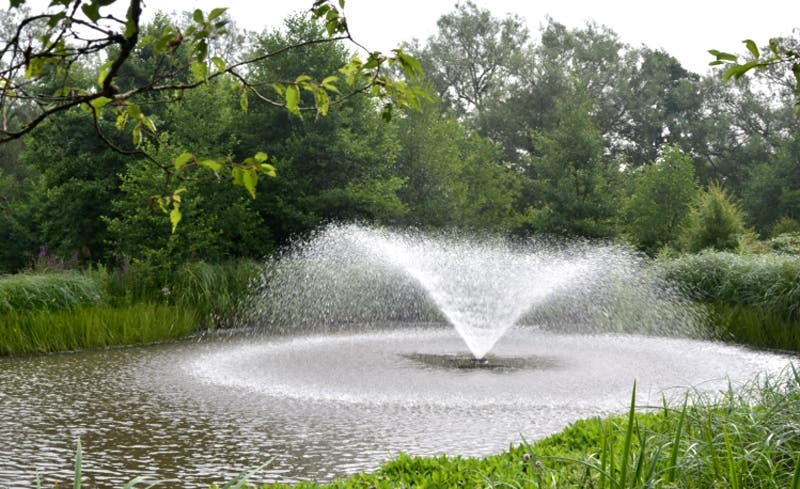 It would be very nice for this trip, as we wouldn’t have to charge at all, though I would stop here anyway, because it’s so nice, and I would be very tired by now. So, we are plugged in now, and the charger says we started charging from 25%, so, if we take the range as being 60 miles on a 100% charge, 25% is a quarter of that, which is 15 miles. So according to that, as the full range is a bit more than 60 miles, we could have just about scraped into the next services, without stopping here, but there’s no way I would have missed stopping at Gloucester, because it’s such a nice place. So, right now, I shall think no more about it, and enjoy the a break. 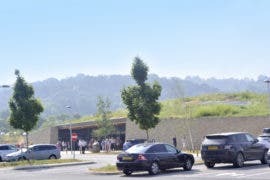 Time: 10:54 – I am just pulling out of Gloucester Services, having spent much longer than I intended, or needed to. I could have just charged for 10 minutes to get enough to get to the next services, and then charged up fully there, but I’ve been taking a few photos, and looking around, as it’s all so lovely here. 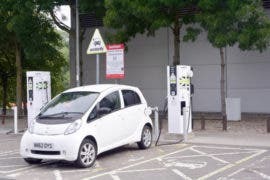 Time: 11:16 – I’ve just arrived at Michaelwood Services for the last charge before I get to my destination in Frome, Somerset. Michaelwood Services is nothing to write home about, but it has a charger, and I am plugged in, just waiting to get enough for the next 43 miles, and I will be happy with 85%. It takes quite a bit longer to go to 85%, rather than stopping at 80%, because the charger is much slower after 80%, and because it stops automatically at 80%, you have to run the smart phone app all over again, to start the second charge, just for 5%. I probably did not really need to do that, but I couldn’t be sure, as part of the route is hilly, and hills reduce the range. It’s now 11:53 I’m just leaving Michaelwood services. 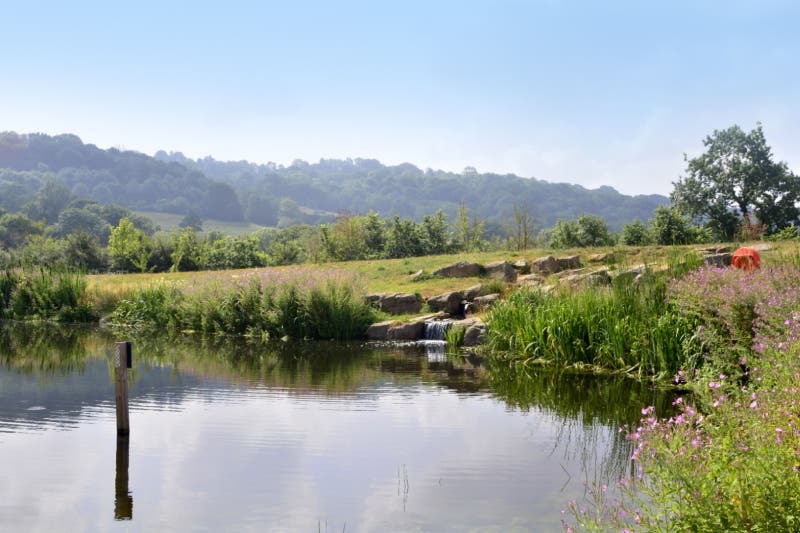 I will continue on the M5, turn east onto the M4, and then, coming off the M4, head south past Bath, to Frome. This is the final leg of our long journey, and will mainly be off the motorway. This part of the journey is very picturesque, being hilly, and green with lovely sandstone buildings. Time 13:15 – Well, finally I am here, at my daughter’s house, so my little car has proved itself, once again to be an inter-city car, having got me all 150 miles, across about 5 counties, in just over 5 hours. The total cost of charging up on the journey would have been about £3, but the charge up at Gloucester was free. So, 150 miles for £2 – you can’t get cheaper than that. I could have done the journey more quickly, if I hadn’t stopped so long at Gloucester, and if I had thought of going the shortest route from there to my daughter’s house but it was not too bad a time, and I enjoyed the journey. I need not have charged above 80% either, which used much extra time, but I wasn’t to know that. 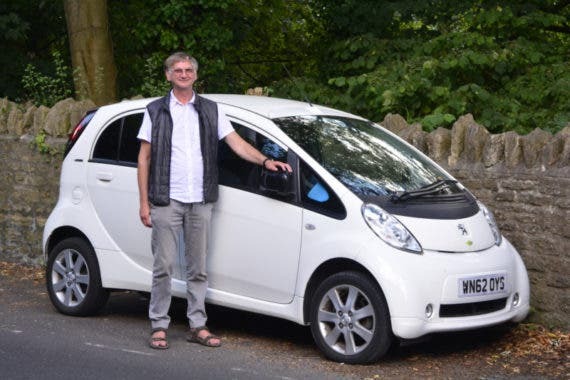 It would have been even quicker if I had been able to borrow a new Nissan Leaf, or a Hyundai Ioniq, as I could have come down with only one stop at Gloucester. Someone was even trying to say that the Nissan Leaf is “only a city car,” because of limitations on fast charging, but as I would not need to charge at all, during a 150 mile trip, and would charge at level 2 at the destination, that is hardly a sensible thing to say. Soon, I shall be enjoying a nice cup of tea, in the tranquillity of my daughter’s garden, probably, soon followed by some delicious home cooking, considerably better than my own.